St Martin’s Croissant is one of the most recognizable and undoubtedly one of the tastiest symbols of Poznań. It is definitely a delicacy worth trying and taking home with you. St Martin from Tours was a Roman legionary who, during one freezing cold winter, shared his coat with a beggar. Through his selfless act, he became a symbol of mercy. This story was often told during November sermons in Poznań’s many churches, on the day of the Saint’s remembrance (November 11th). As the story goes, during one of these sermons, in 1891, father Jan Lewicki called upon his parish to support the poor. His call was heard by the baker Józef Melzer. He decided there and then to bake and give away to the poor a few trays of specially prepared croissants. This idea was soon picked up on by other bakers, and so the tradition of St Martin’s Croissant was born… Or so it was in the most famous version of the story, anyway. Was it truly the case? Not entirely. We happen to know that ads for croissants had been appearing in the local press long before the events of the story. These ads go back as far as the 1850’s and 60’s. Where can you learn all the secrets of Poznań’s greatest culinary treasure - St Martin’s Croissant? Why of course - in Poznan Croissant Museum (Rogalowe Muzeum Poznania)! Its visitors will enjoy the story of St Martin’s Croissant told live, as well as experience the process of baking the pastry together, including a lesson on the Poznań dialect. All of this in the interiors of a historic townhouse with the view of the famous Poznań billy goats. Traditionally certified croissants can be bought in many pastry shops around the city. Business visitors will appreciate Mercure Hotel’s confectionery. Here, croissants are made practically around the clock. They can be ordered and picked up at the hotel’s reception at any appointed time, day or night. In this way, everyone can have a chance to take home a fresh and deliciously fragrant souvenir from Poznań. Although today the croissants are available all year, their popularity peaks around November 11th. According to tradition, that is when they taste their absolute best, and are sold by the dozen. During St Martin’s Street namesday celebrations, Poznań pastry shops and cafes sell as much as a few hundred tonnes of the delicacy. For a few years now, St Martin’s Croissants can also be ordered online. Poznań natives can now send sweet gifts abroad or .. simply get some for themselves, while being away from home. At this point it is worth mentioning that other cities in Poland have tried to pass off counterfeit versions of Poznań’s famous pastry. This is why the source of St Martin’s Croissants is so vital. The authentic ones, and also the best, come exclusively from Poznań and Wielkopolska. Their uniqueness has been appreciated in 2008, and St Martin’s Croissant has become a regional product, under the protection of the European Union. Poznań’s Bakers and Confectioners’ Guild carries out regular inspections of the croissants and only those fulfilling their strict criteria may be worthy of the St Martin’s Croissant name. 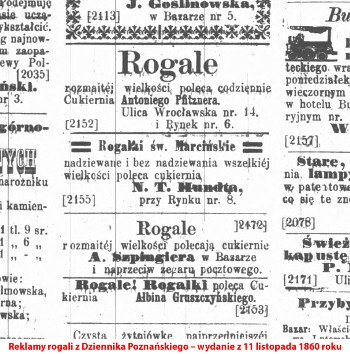 In 2012 this right, and privilege, has been awarded to Poznań’s 98 bakeries and confectioneries. The croissant is not only a delicacy - it is also a way of having a great time, worth sharing with your colleagues and friends. What the making of the famous Poznań pastry looks like, and how Poznań’s journalists were able to cope with the task of making one from scratch can be seen in a short documentary film, shot during a St Martin’s Croissant Baking Workshop.